What does consolidation in yoga practice mean to you? How do you distinguish that line between being committed but not aggressive in your practice? I would love to hear your thoughts. Amazing post, thank you for this! I can also relate in my struggle to be less intense and still gain from my yoga practice. Having played team sports competitively most of my life and now having to transition to less high impact activities due to so many foot and ankle injuries over the years, I find myself forcing it. In other words, feeling like I have to hold longer, push deeper, stretch further…as if it would affect me more or positively as opposed to the potential damage it could be doing. This post has helped me realize, one, I am not the only one suffering from thinking I’m not working hard enough in yoga, and two, that I should remember yours and Iyengar’s words of wisdom on effortless effort. Thank you! It will continue to take time and effort to become effortless, lol. But I will keep your posts and support in mind. thx Dana, for opening up and sharing your experience. Finding that edge between overworking and under working can be really tough, and to complicate things even more, it can often be a moving target. What is appropriate on one day, may not be on the next day. But like you say, keeping BKS Iyengar’s words in mind and reflecting on how each practice affects your body, your breath, and your state of mind, I think you will find you can learn a lot :). Good luck with your practice! That’s a bit of a tricky question. 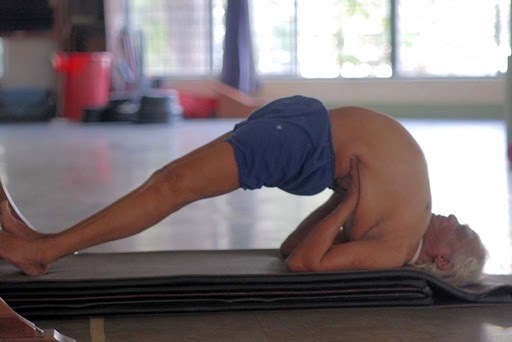 I think the best advice I can offer you is to seek out an experienced Iyengar Yoga teacher and attend classes regularly. A good teacher will be able to help you along and guide you towards progress in your practice. Good luck!